Forty-nine men have appeared in court in Afghanistan over the lynching of Farkhunda, a 28 year-old woman who was accused of burning the Quran before she was brutally beaten to death. The trial at Afghanistan’s Primary Court kicked off Saturday in Kabul, over a month after the attack on March 19 ended with the burning of Farkhunda’s body. The religiously-motivated assault sparked outraged protests for justice, in a country where gender inequality is entrenched. Of the 49 men at the stand Saturday, BBC reports, 19 were police officers accused of failing to stop the attack. Given the outrage following Farkhunda’s death, it makes sense that authorities might want to publicize their attempts to pursue justice. The opening of the trial was broadcast live on nationwide television, according to The Guardian. During the broadcast, the prosecutor listed the charges against 10 of the defendants, which included assault, murder, and encouraging others to get involved in the attack. Although the policemen are charged with neglecting their duties, The Guardian notes that several are thought to have actively participated in the assault. Following the killing, cellphone footage of the assault circulated on the Internet, showing that the mob had beaten Farkhunda — who was training to be a religious teacher — with sticks and stones, run over her, then burned her body before dumping it in the Kabul River. An official investigator later found that the charges brought against Farkhunda were unsubstantiated. Afghan President Ashraf Ghani had ordered the investigation, which discovered no evidence that the young woman had burnt the Quran. 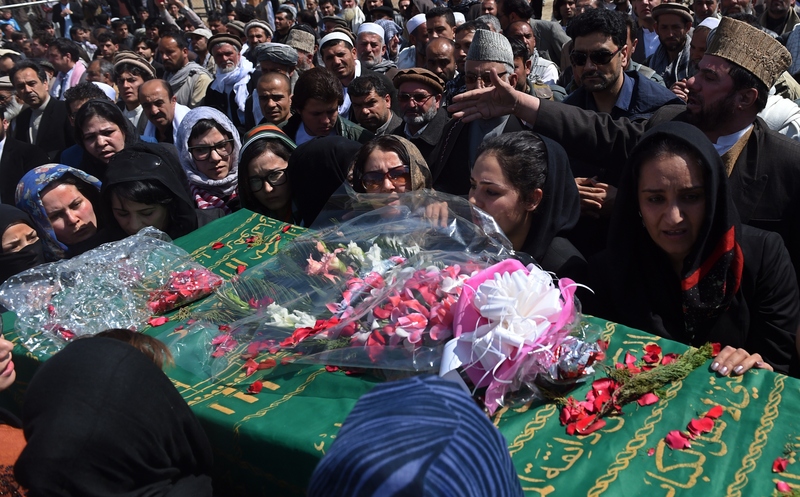 “Farkhunda was totally innocent,” General Mohammad Zahir told reporters at Farkhunda’s funeral. On Saturday, the primary court’s head, Safiullah Mojadedi, requested that senior officials, including Kabul’s police chief and the chief criminal investigator, attend Sunday’s court session. The accused wore dark clothing that had been handed to them in prison, and two of them claimed that they had only confessed under physical duress. Justice in Afghanistan is difficult to access at the best of times, and women face an especially hard time when wrangling with the judicial system. The United States Institute of Peace reports that although women’s rights have improved somewhat since the fall of the Taliban in 2002, women’s access to justice remains “extremely limited.” In the chronically insecure country, women generally avoid official mechanisms altogether — dissuaded by social norms from asserting their rights and preferring to get what justice they can at a familial or community level. In 2013, the United Nations found that despite constitutional guarantees of protection and gender equality, women were increasingly becoming victims of violence while being sidelined by the justice system. In a country rife with minor and major infringements of women’s rights, the attention garnered by Farkhunda’s death is all the more important and surprising. I didn't think of it as a political demonstration. I was just doing it for Farkhunda, and everybody was just doing it for Farkhunda. It was a simple demonstration to raise our voices and for people to see what happened to her.